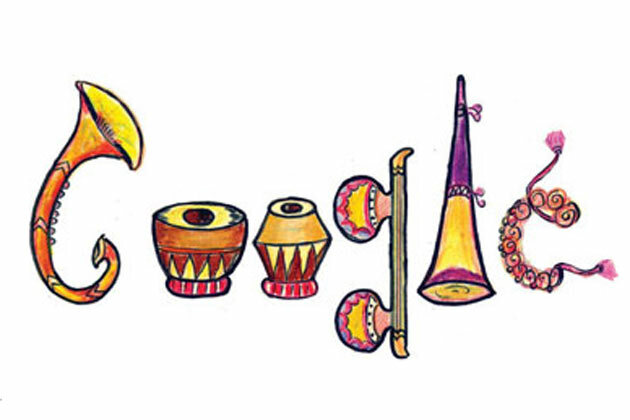 The doodle on Google's India page today has been created by Varsha Gupta, a Class III student from Ryan International School, Greater Noida. Varsha was chosen as the winner of this year's Doodle 4 Google competition organised by Google. Google had announced that it would put the winning Doodle 4 Google entry on the Google India homepage on Children's Day - 14th November 2011. Google India celebrates Children's Day with 7-year-old Varsha Gupta's Indian Musical Instruments doodle. Explaining her doodle, Varsha writes, "India is a land of different cultures. In India, music plays a very important role. India has given many musical instruments to the world. Goddess Saraswati plays Veena, God Shiv plays Damaru. According to our mythological stories musical instruments used to be played on all the occasions. Even during war musical instruments were played. Lord Krishna's flute is known in the whole world for its magical music. In modern days Mr. Zakir Hussain is world famous as Tabla Mastro and Pandit Shiv Kumar Sharma is known as a great Santoor player all over the world". Google India had presented Varsha with the winning certificate along with a technology starter package including a laptop, a year's Internet connection and a Rs 2,00,000 technology grant for her school. The competition was open to all students from Class I to Class X. This year participants were challenged to imagine their own version of the Google logo based on the theme 'India's gift to the world'.